Antioxidants…free radicals….oxidative stress…We have heard of these but what do they all mean and how do the effect our health? The environment we surround ourselves in is full of toxins, chemicals, x-rays, pollutants, herbicides and pesticides all which cause damage to cells, proteins, and DNA. Fortunately, our bodies are capable of counteracting the damaging physiological processes that occur naturally. In order to control these destructive chain reactions our body circulates nutrients for their antioxidant properties and manufacturing metabolic enzymes. Free radicals are a biological response to environmental toxins produced when you have inflammation in your body and when you exercise. Free radicals can cause damage to our cells, accelerate aging, and even are linked to cancer. But they also play an important role in a number of biological processes, such as the intracellular killing of bacteria by white blood cells and some cell signaling processes which can increase tissue repair and immunity. Oxidation reactions occur when the production of these free radicals is beyond the protective capability of the antioxidant defenses. 1. Superoxide ion is derived from oxygen. This free radical can cause damage to mitochondria, DNA and other molecules. 2. Hydroxyl radical is formed by the reduction of an oxygen molecule and will only react with molecules its vicinity. Because of its high reactivity it will damage most organic molecules such as carbohydrates, DNA, lipids and proteins. 3. Singlet oxygen is formed by our immune system. Singlet oxygen causes oxidation of LDL cholesterol which produces inflammation in your arteries promoting atherosclerosis. 4. Hydrogen peroxide is not a free radical but it is a byproduct of metabolic reactions and can play a role in the immune system. Glutathione One of the most powerful antioxidants known is glutathione. Glutathione is comprised of three amino acids: cysteine, glutamate, and glycine which makes it a tripeptide. It neutralizes free radicals, enhances the immune system and detoxifies the liver.2 Deficiency of glutathione contributes to aging as well as many diseases such as Alzheimer’s, Parkinson’s, cardiovascular disease, AIDS, cancer, liver disease and epilepsy.3 It is found within every single cell of your body and has the unique ability of maximizing the activity of all the other antioxidants, including vitamins C and E, CoQ10, and alpha lipoic acid. Your dietary sources include vegetables and fruits particularly asparagus, spinach, avocado and squash. Consuming protein is also essential for the formation of glutathione. Increasing Your Antioxidant Levels Although it is difficult to absorb taken orally because glutathione is broken down by enzymes in the intestine, supplementation and a healthy diet with precursors for the synthesis of glutathione can increase production. Cysteine, one of the amino acids that actually makes glutathione, can be taken as a supplement in the form of N-acetyl-L-cysteine. For antioxidant protection, one can take 500 mg daily to start.7 The dosage may be increased, with your doctor's supervision. Dietary sources can be found in eggs, turkey, and chicken. Alpha lipoic acid (ALA) which regenerates glutathione is both water and fat soluble. This means it can attack free radicals throughout the body, including in the brain.6 Dietary sources can be found in organ meats, broccoli, brussel sprouts, yams and spinach. A few studies have suggested that 600 mg of alpha-lipoic acid supplementation may enhance the body's ability to use its own insulin to lower blood sugar in people with type 2 diabetes and improve symptoms of diabetic neuropathy such as numbness and tingling.5 Selenium is one of the most important minerals that help the body recycle and produce more glutathione. Dietary sources of selenium can come from brazil nuts, meats, and seafood. Vitamin C and vitamin E also help neutralize free radicals. Where to Start As you can see, antioxidants are very beneficial to the body. 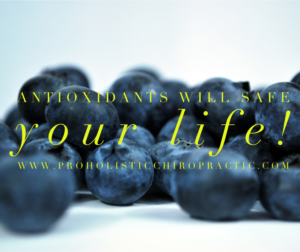 Although we are capable of producing many antioxidants on our own, the environment, toxins, poor diet and lack of exercise can increase the damaging effects of free radicals and make it hard to keep up with. Do you want to know exactly what you are missing from your diet? By getting a comprehensive blood analysis and tissue mineral analysis your experienced nutritionist can identify deficiencies and toxicities which may be causing underlying illnesses. Get tested today to get on the right track towards optimal health!